The legendary Paekākāriki Playcentre Bonanza returns! There'll be great food and coffee, live music, a live auction, a raffle, a plant sale and a whole bunch of brilliant bargains in our jumble sale for you to snap up! We'll also blow up that bouncy castle and there will be lots of fun for the kids. 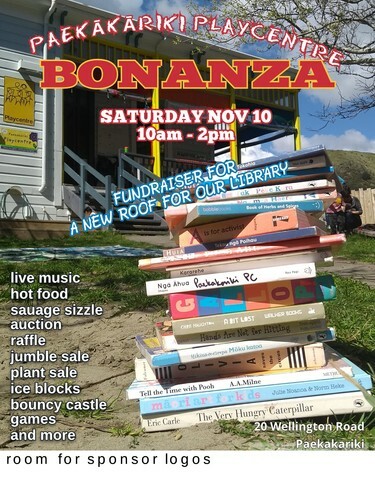 This year, we’re hoping to raise enough money to fix our library’s leaky roof, so come and support your local tamariki, in true Paekāk style!